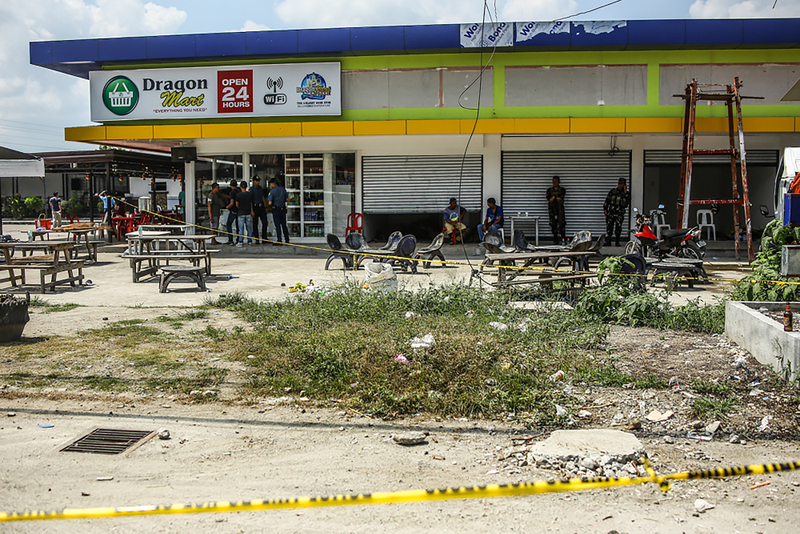 Police and military personnel stand near the site where two bombs exploded and injured seven people at a gasoline station in Tacurong town, in southern Sultan Kudarat province, April 18, 2017. Philippine authorities were pursuing unidentified gunmen who snatched two people after a shootout that left six others dead in southern Zamboanga del Norte province, the military reported on Saturday. The coast guard as well as navy troops have dispatched troops to locate the suspects, who seized a pro-government militia leader and his wife during the Friday night incident in Sirawai town, according to a military intelligence report. “An encounter took place in the vicinity of Sirawai between CAAs of said detachment against unidentified armed group,” the report said, referring to the Cafgu Active Auxiliary, a government militia unit under the control of the military. The suspects escaped using two motorized boats, it said, adding that two militiamen and four civilians were killed in a brief gunfight that ensued. Navy and coast-guard forces were conducting blockade operations, but the suspects and their captives had not yet been located on Saturday, the military said. The military report identified the abductees as 62-year-old Rufo Roda, and his wife Helen. Roda was a former militia leader, and police have yet to determine the motive for his kidnapping. Blood feuds are common in the troubled Philippine south, particularly in far-flung areas where the police and military rely on militia units to augment their forces. The violence occurred as police and military were on heightened alert in the south, after pro-Islamic State (IS) militants bombed a town fiesta earlier this week, killing three people and wounding dozens in Isulan, the capital of Sultan Kudarat province. That attack came weeks after IS claimed a suicide bomb attack in the nearby island of Basilan that left 11 people dead. Last year, pro-IS fighters laid siege to Marawi, unleashing a five-month battle with Philippine military forces that devastated the southern city and resulted in some 1,200 deaths, mostly of militants. Philippine forces broke the siege in October 2017 and killed militant leaders including Isnilon Hapilon, the chief of the IS branch in the Philippines. But President Rodrigo Duterte's government, which last year imposed martial law in the south to deal with the militant takeover of Marawi, is now considering extending military rule across Mindanao beyond 2018.